Semi-shade tolerant to full sun. Adapted to oak woods and prairies of central Texas with annual rainfalls of 20 to 40". 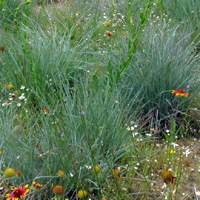 Plant this Little Bluestem in the Blacklands, Edwards Plateau, Cross Timbers, Lost Pines & Rolling Plains to help restore habitat for bobwhite quail, white-tailed deer, rio grande turkey, le conte's sparrow. High genetic variability in this population produces divergent growth forms resulting in some individuals being shorter and some taller. A foundation species, Little Bluestem is absolutely beautiful in commercial & residential landscapes. Little Bluestem once dominated our tall and short grass prairies from Canada to Mexico. But almost everywhere that could be plowed has been plowed. Texas, the largest prairie state, has the least acres conserved. Besides a few refuges, current-day sightings still find it growing on thin, infertile, highly erodible soils...surviving harsh conditions with good land stewardship practices. Sadly, in many regions, 'Lil Blu' is almost gone. 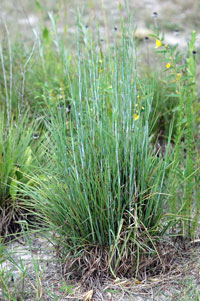 For the Landscape, Little Bluestem can be grown from seed. Being a well-behaved 1 to 4' clump grass makes it ideal for blue-green spring color. Later in the growing season, with no mowing and blessed mid-summer rains ...seeds begin to form. By autumn, rich bronze stems with frost-white, fuzzy, dew glistened seeds sparkling at sunrise helps us to remember why Comanches fought so hard for this land. Howling cold northers eventually blow seeds to the winds...where ground nesting quail, meadowlarks or grasshopper sparrows forage for food. For Ag producers, 'Lil Blu' greens up a month earlier than alien coastal bermuda and provides excellent grazing until maturity. Native hay meadows are low-input. 'Lil Blu' does not like petro-fertilizers. Good stewardship includes managed grazing, no late haying or short summer mowings, and a prescribed burn plan. Little Bluestem prairies can last perpetually. For Wildlife Valuation, Little Bluestem qualifies as food and habitat. The seeds are nutritious for goldfinch, quail, dove, and many mammals. Excellent ground-nesting cover for prairie birds, mammals and larval food source for butterflies. Little Bluestem was once so important for forage, the USDA Plant Materials Centers developed several 'improved' selections called cultivars, mostly taken from northern and mid western prairies decades ago. Agronomists targeted selections with highest forage production. After years of refinement and processing of cultivars and certified seeds, many naturally occurring genetic adaptations are intentionally bred out to control uniformity. If local adaptability to changing environmental conditions over time is important to you ...consider planting diverse Native, Non-certified seeds. Usually the best adapted seeds are natives harvested reasonably close to the planting site with no supplemental breeding or trait selecting. How close? How ever far a buffalo can run.